Your best friend deserves the best, so suit up your pup with Banded's 5 mm Dog Parka, a protective, bouyant, heat conserving garment that dogs will love. Your best friend deserves the best, so suit up your pup with Banded &apos;s 5 mm Dog Parka, a protective, bouyant, heat conserving garment that dogs will love. Realtree Max-4 wetlands camo is one of the most successful duck hunting camo patterns ever designed. It is the culmination of Bill Jordan&apos;s years of experience creating and marketing camo designs. The Max-4 camo design features cattails, mullet, milo, cornstalks, sunflowers, oak and maple leaves, cedar and oak limbs, and a variety of other plant life. 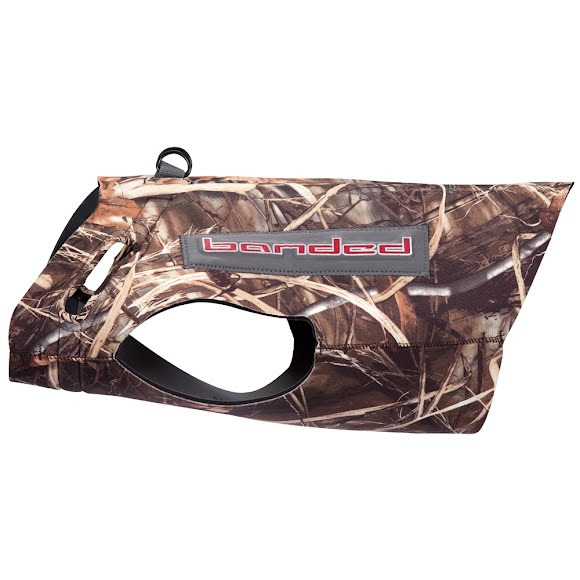 The pattern offers maximum effectiveness as waterfowl camo in any open terrain without geographical limitations. It is the largest camo artwork on the market.